The main goal of establishing a youth cultural club was for the youth to feel the space. They were included in all the activities that took place in eMCe plac, young creators also had a hand in creating the appearance of the club. The greatest value of the club is still acting on the principle: youth for youth. Young people actively cooperate with program suggestions in all areas, they help with organization and execution of events and activities, which gives them a chance to co-create a program that interests them as well as gain knowledge and experience in the field. Those that have studied here and gained informal education and experience, now successfully work in various business areas in local and other communities. The youth cultural club eMCe plac will work in accordance with its mission and needs, wants and expectations of youth and other youth organizations. By operating like this and with active inclusion of youth and consequently with preparation of a creative and quality program, it will become one of the most recognized youth spaces on the national level. The youth cultural club eMCe plac is a public space for youth and young at heart, that operates with the purpose of providing an active life for youth and realizing their interests specifically in the area of youth work, culture and art, social work and education. The club realizes its mission with programs and projects that are products of its own operation, cooperation with other youth and similar organizations in Šalek valley and active participation of young individuals. The youth come from various social backgrounds and they actively participate on all levels. This is how club eMCe influences the relevant social, cultural and youth environment on a local and national level. The larger eMCe plac club team is comprised of more than 60 youth – students, volunteers, members of various subcultures and other external collaborators. 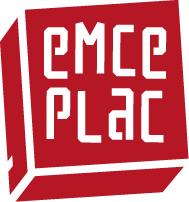 If you need regular or occasional student work and you have the desire to co-create the musical or gallery program or become a member of societies that are active in eMCe plac or want to be a part of the organizational team of festivals, write to us at info@emceplac.si.